WASHINGTON—In the wake of the $1.5 trillion tax bill’s historic passage in both the House and the Senate, GOP leaders reportedly celebrated Wednesday their decisive win over everyday American citizens. 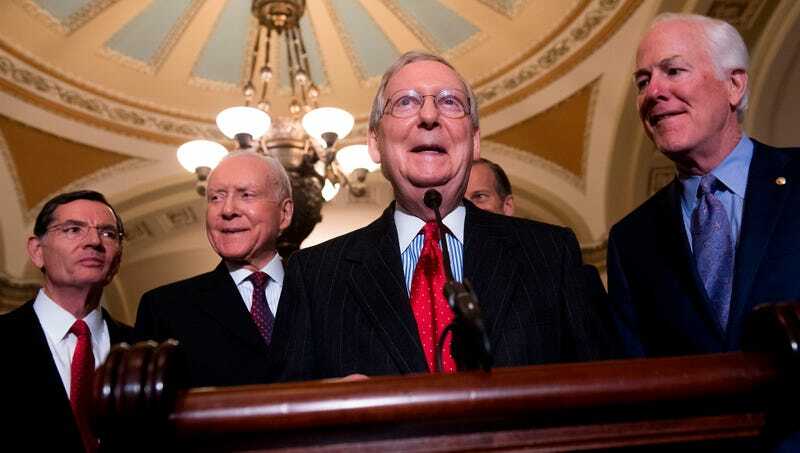 “This is a monumental victory not only for us, but for everyone struggling under the reign of the average American,” said Senate majority leader Mitch McConnell, adding that party leaders made a promise to “take a stand against ordinary U.S. citizens,” before cracking open a bottle of champagne and proudly declaring that “today, we delivered.” “Of course, the fight against the people of this country is not yet over. We won this battle, but the war is still to come. However, if we carry on with the same vigor demonstrated today in our widely opposed tax overhaul, I know that we will prevail over Americans time and time again.” GOP leaders also expressed confidence that they would achieve another dominant victory over the American people as they push to close the deficit by cutting food stamp programs, Social Security, and Medicare.